MINISTER for Public Expenditure and Reform Brendan Howlin was in Doolin on Tuesday to visit the location of the proposed €6m pier project. His visit coincided with the signing by Clare County Council of a contract with L&M Keating, the successful tenderer for the construction of the new pier. Construction work will begin in the coming days and is expected to be completed by the middle of next year. Mayor of Clare, Joe Arkins, said, “The project has been long sought after by ferry operators, fishermen and tourists,who use the pier. 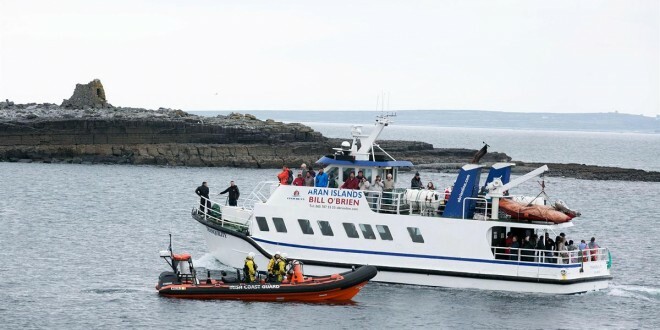 The completed pier will be used mainly to facilitate ferry activity between North Clare and the Aran Islands and the Cliffs of Moher during the tourist season, while the existing pier will be available to accommodate other activities – both leisure based and otherwise. The new pier will ensure that Doolin is accessible in all tidal conditions, which will be of particular benefit to Doolin Search and Rescue as well as the ferry operators. Meanwhile, the minister also visited Ennis to view the new flood defence works on the River Fergus, as well as canvassing with European Parliament candidates.